When he got an offer for The Man Who Fell to Earth, which would be directed by Nic Roeg, his image changed all over again. The album Station to Station would be on its way and a new tour, also. It seemed as though David was pretty busy - a film, an album and a tour. The Thin White Duke was derived from the album's title song, 'Station to Station'. Throwing darts in lovers' eyes…"
After The Man Who Fell To Earth, his tour for Station to Station would later cause the Nazi salute incident, and a move to Berlin…. After seeing "Cracked Actor", they were convinced that Bowie was the man for the job - to play Thomas Jerome Newton in Nicolas Roeg's new science fiction 'masterpiece'. Bowie met Candy Clark, who became an addition to the many people he had acquainted with since he became famous, and made his film debut. In the Man Who Fell to Earth, his hair was dyed bright red with a tint of orange-red in the sun, and his roots were blonde. The main image of the Thin White Duke was his black and white costume - a conservative oufit, and his blonde, slicked back hair. While working on the set, he was also working in the studio with Station to Station. 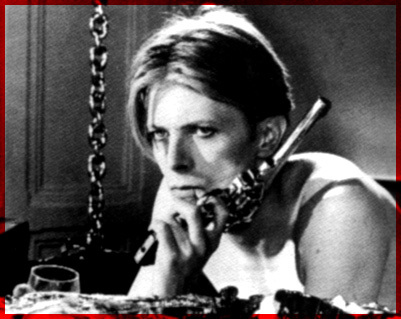 Rumours for the MWFTE Soundtrack go as follows: Without further notice, Bowie began working and thinking on some tracks for the soundtrack, but Nic Roeg told Bowie that there would only be a soundtrack if he would add his songs to others on the list. Bowie said "forget it" and dropped the whole idea. He was working so hard, and it was not worth it for him to place his genuine tunes on the album with some other songs.